Situated in the blandly-named low-profile North West Province, these two relatively recently-created reserves have grown in popularity in recent years thanks to their family-friendly location in a malaria free-zone and excellent Big Five viewing. Pilanesberg and Madikwe are quite similar in ecological terms, both being situated on the transitional zone to the moist eastern bushveld and the semi-arid Kalahari biome that extends into neighbouring Botswana. The usual safari favourites are supplemented by many dry-country species at the eastern limit of their range. However, two reserves cater to very different clienteles. Pilanesberg, only two hours from Gauteng, stands adjacent to the glitzy Sun City casino and resort complex and is geared primarily towards self-drive day and overnight visitors. By contrast, the more remote Madikwe is closed to day visitors and caters exclusively to the top end of the safari market, hosting a few dozen exclusive bush camps that offer plush accommodation and all-inclusive packages comparable to the private reserves bordering Kruger. Now entrenched as South Africa’s premier malaria-free safari destination, the 750 km2 Madikwe Game Reserve abuts the Botswana border some four hours’ drive northwest of Gauteng. Flanked by the perennial Great Marico River, the reserve was established in 1991 following a government study that concluded it could be utilised more profitably and offer greater benefits to local communities as a conservation area than as an unproductive farm. Following an extensive program of reintroduction, it now offers an excellent chance of sighting three of the ‘Big Five’ – lion, elephant and rhino – while buffalo and leopard are also present, but scarcer. Common grazers include giraffe, zebra, greater kudu, springbok, Red hartebeest and tsessebe. It is also possibly the most reliable reserve in South Africa for encounters with the endangered African wild dog, and night drives frequently offer good sightings of the shy brown hyena and bizarre aardwolf. A checklist of 350 bird species includes several northwestern specials, most conspicuously the Southern pied babbler (dubbed the ‘flying snowball’ for reasons that become obvious when you first encounter one) and the exquisite Crimson-breasted shrike, Shaft-tailed whydah and Violet-eared waxbill. Nestled scenically within a collapsed volcanic crater, the 550 km2 Pilanesberg Game Reserve supports game densities similar to the likes of Kruger, and ranks as one of the best places anywhere in South Africa for close-up encounters with white rhino and elephant. Situated only two-hours drive north of Gauteng, it forms a realistic goal for time-pressed travellers looking for a malaria-free overnight safari destination out of Johannesburg or Pretoria. Large predator sightings are comparatively hit-and-miss, but odds of encountering lion or leopard - along with the strictly nocturnal brown hyena and aardwolf improve greatly if you join a guided night drive into the reserve. As with Madikwe, a checklist of 350 bird species includes several species that reflect its transitional location. Established in 1976, Sun City is sometimes dubbed Las-Vegas-in-the-bush. 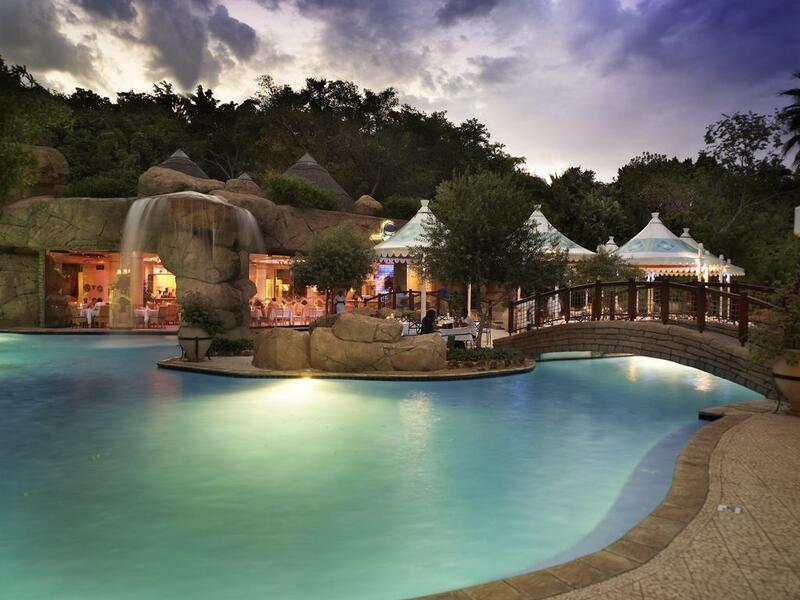 While the massive casino at the complex’s heart just about justifies this tag, it also doubles as a fun family-friendly destination boasting a fake inland beach called the Valley of Waves, two superb golf courses designed by Gary Player, and day safaris into the adjacent Pilanesberg. Three scheduled flights weekly connect Johannesburg to Pilanesberg Airport, which also serves Sun City. It is arguably easier (and quicker) to drive. This takes about two hours from O.R Tambo Airport, Johannesburg or Sandton, or 90 minutes from Pretoria, via the scenic Hartebeespoort Dam. It is also easy to arrange a road transfer to Sun City or Pilanesberg. It’s more like four hours’ drive from Johannesburg to Madikwe, and since all lodges here offer all-inclusive packages and self-drive exploration is forbidden, the best option is to fly. Accommodation at Madikwe is limited to upmarket lodges. Pilanesberg and Sun City offer everything from five-star resort hotels and upmarket game lodges to budget-friendly rest camps within the reserve.